I grew up in Roxbury, Connecticut, a small community in the rolling hills of Litchfield County. 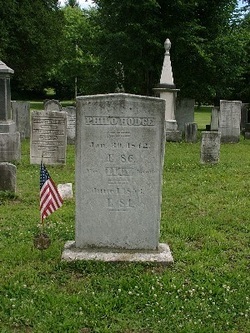 Philo Hodge, my fourth great grandfather, had moved to Roxbury sometime in 1782. The home in which I grew up had been built by my father on the property my third great grandfather Chauncey Hodge had been given by the town proprietors in return for his service as a surveyor. The lot had been a cornfield farmed by my second great grandfather Albert Lafayette Hodge. Albert was a bit of an entrepreneur. After the local iron mining operation failed, he bought Mine Hill, established a sawmill on the banks of the Shepaug River, and ultimately opened A. L. Hodge and Son, a hardware store and lumber supplier. He even had a granite quarry on Mine Hill. Albert had two children: his bachelor son Charles Watson Hodge, a bank president in New Milford; and his daughter Elizabeth “Libbie” (Hodge) Pons, the wife of the local country doctor Louis Jacques Pons. Louis was an immigrant in 1874 from Eupen, a town then in the Prussian Rhineland but now in Belgium. He had been a farmhand in the 1880s when a local man named Henry Booth had tapped him as the town’s future doctor. Booth sent Louis to the University of Vermont for his medical degree. In return, Louis served Roxbury for 25 years as its medical doctor. Then, prior to World War I, my great grandfather Louis moved his family to the Devon area of Milford, Connecticut. There, he could send his beloved only child Adelaide to a finishing school. Her prospects improved, Adelaide married William Oscar Mathews, a certified public accountant with a business college degree. Following the death of her uncle Charles Watson Hodge, Adelaide inherited the family lands and businesses. She had promised Charles that, seeing as how she was a woman, her husband would run the businesses. Adelaide and Bill built a granite home in the 1930s on land she had inherited from her uncle Charles — it helps to own your personal granite quarry and lumber yard during the Depression — and moved back to Roxbury. My father Charles Pons Mathews worked at that lumber yard and designed pole barns. It’s not surprising that family history grabbed my interest when I was surrounded by it. What really did the trick was reading Philo Hodge’s Revolutionary War pension testimony. I felt I could hear him speaking to me. Photograph courtesy of Microsoft Office.